Striped South is an officially unnamed summit on the Sierra Crest found south of Taboose Pass and - you guessed it - Striped Mtn. It has enough prominence to make it an official 13er and land itself on this year's Challenge list. The primary drawback is that we would once again have to hoof it up to Taboose Pass though in hindsight that might have been unnecessary. Unbeknownst to me until near the summit, the South Slope is a straightforward class 2 scramble and it would probably have been faster & easier had we approached from Armstrong Canyon, even starting at the 2WD TH at Scotty Spring. No, we would do it the more convoluted way from the west because that seemed the more obvious choice to me in the months leading up to it. I think somewhere buried in my psyche I must really enjoy Taboose Pass. Taboose Pass during the Challenge means an early start and today it was 5a when our small band had gathered to start. It was the smallest group yet with only eight of us starting out by headlamp (Eric had started a few minutes earlier and missed the photo op). Luke and JD were heading to Ruskin, an even longer outing than our quest to Striped South was expected to take. It was a fairly fast pace climbing up the trail. The TH start low, just below 5,500ft and climbs 6,000ft in seven miles, a pretty steep gradient even by Eastern Sierra standards. Sunrise came around 6:15a when we were not yet halfway to the pass. It would not take long for the chill of the early morning to be supplanted by the rising sun and I didn't mind the stretches where we were steeped in shade against the hillside. I was about 5min short of my goal to reach the pass in three hours, Eric already there when I pulled in short of breath. I'm not sure how long he'd been waiting there, but he was still sporting a shortsleeve shirt and shorts as though no amount of cold could bother him. The group of six that would head to Striped were all assembled once more by 8:15a at the pass. There was just enough time for Tom to do his yoga headstand (something to do with relieving pressure on his back) before we started down the west side of the pass a few minutes later. The most delightful part of the day was the next two miles where we traversed around the west side of the crest to approach Striped South from that side. We traveled across alpine meadow and granite rock gardens as we gained some easy elevation to reach the large unnamed lakes found at the 11,400-foot level northwest of our summit. At a small tarn not far above these lakes we paused to refresh our water supplies as it was likely the last location to find any before starting up the peak. Our first view of Striped South was not an encouraging one as it appeared that the entire West Face between Striped and Striped South was one large, massive cliff. This was the first moment it occurred to me that we might not actually find a way up, and the quandary it might cause. Would we all end up with a DNF? That would really through the jersey situation into a fine mess. The only thing to do, it seemed, was continue on and hope the face was not as vertical as it appeared from a distance. Thankfully, it wasn't. As we scrambled over the tedious boulder and talus above the tarn, the face did not seem so imposing the nearer we got. To the right it seemed to me that there might even be some good class 3 scrambling up several possible chutes that presented themselves. For his part, Jonathan liked the looks of the talus slopes leading up the middle of the face between Striped and Striped South. He was very vocal in describing his preference, doing his part to convince the rest of us to agree, but we were not that pliable a group. I much preferred the chance of more solid class 3 scrambling than class 2-3 crud and had set my sights on the right chutes, and it seemed the others tended to agree. Jonathan thus found himself alone pursuing his route. The five of us that headed right broke into smaller groups which was probably a good thing because the chutes were anything but solid. Eric and I were in front cautiously making our way skyward while watching carefully what we were knocking down in the other direction. So much promise from below turned out to be ledges and slabs loaded with gravel and other loose material that took much of the fun out of the route, though it was class 3 as hoped. Below us, often out of view were Tom and Nick taking slightly different tacks on our choice of chutes while Michael had slowed more and was somewhere behind, out of sight. When we finally reached the crest after 45mins' effort climbing the NW-facing slopes, Eric and I found much easier going. In fact we noted almost immediately the whole SE-facing side of the mountain was an easier class 2 climb. There is a fine view to the south of Pinchot rearing high above a rocky basin found just west of the Sierra Crest. We could just make out someone reaching the summit 2/3mi distance, though not of our group. We watched the person briefly reaching the summit, walking back down a short distance, the tending back towards the top. Perhaps waiting for a companion? Another ten minutes' scrambling along the SW Ridge brought us to the summit where we found Jonathan waiting for us. His route had turned out to be fairly good by his reckoning and faster, too. Striped South's summit had some fine views. One could look east across the Owens Valley to the Inyo Mountains, west across the Sierra Nevada with the Cirque Crest rising above the South Fork of the Kings River. The slightly lower Striped Mtn stood in profile immediately to the north showing it's many striations of light-colored rock for which it was named. The ridge connecting it to our summit was not overly difficult-looking until it begins to rise up the South Face. A few of our group hoped to reach Striped as well, but it did not look like the direct ridgeline was going to work. Michael was the last of our party of six to reach the summit about 20min later, at which time we took a group photo and installed a register. With the exception of Michael who had just arrived, the rest of us were eager to start down to ward off the chill that the cold summit breeze had instilled. Jonathan did not have to press hard to get us to consider his route for the descent seeing as none of the rest of us particularly cared for our own. And so we all headed off the North Ridge with the intent to follow Jonathan down the west side from the saddle with Striped Mtn. We didn't make it very far. A short ways ahead, Jonathan pulled up to examine what looked like a steep but workable sand/talus chute heading down the east side of the ridge, apparently a route used by sheep to cross the crest, judging by the hoof prints we found. We'd talked earlier about making a loop of our route but hadn't held out much hope that we could get down that way - Secor makes no mention of it, just that the East Ridge was class 2 and that the North Face was class 3. This wasn't exactly the North Face, but it was close, and it looked easier than class 3. Jonathan, myself and then Nick all decided to head down without any discussion, just following one after the other. Eric and Tom continued north on the ridge, intending to find a way to the summit of Striped Mtn. The sand/gravel was of the moderately compacted variety that allowed for some boot skiing, but not the deep, bounding stuff that would have made it fun. Instead, more caution was required and it was necessary to let the leader gain a good lead or move to the side before following, as it was impossible not to bring unwanted rock down with it. It was a long way down, some 1,500ft over the course of 2/3mi, most of that in the initial half. We were out of sight from above when Michael came down the North Ridge, having stayed at the summit a bit longer to catch his breath. He, too, spied the descent option down the east side without realizing we had gone down that way, assuming we were on our way down the west side like we'd planned. He decided to follow our route, puzzled by what looked like fresh tracks. While from below we could hear the rockfall he was creating above, alerting us to his presence, he would not find us yet for hours and would be playing catchup the rest of the afternoon. 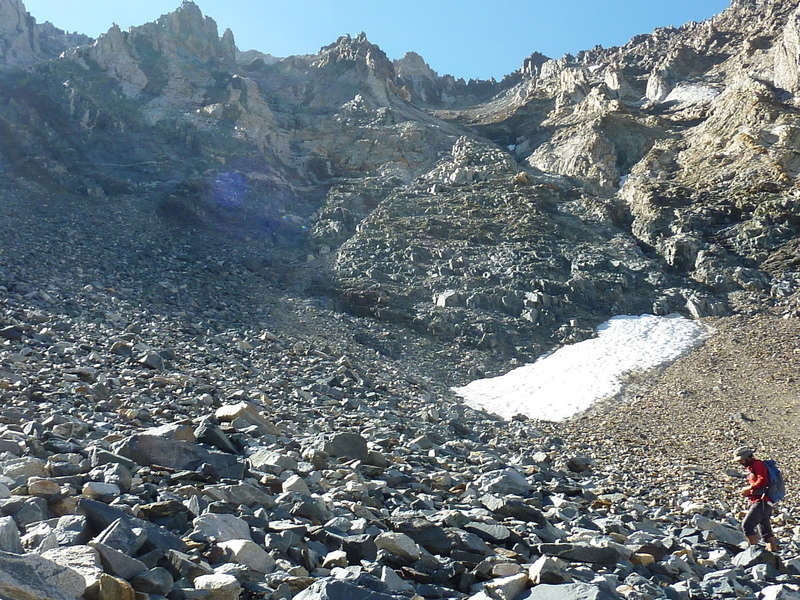 At the bottom we found some old, hard snow, remnants of what was once a northeast-flowing glacier from the cirque between Striped South and Striped. I found some small jawbone pieces to what probably was a small sheep that didn't survive the difficult crossing so young in life. With the messy descent from the crest finished, we had now to recover almost half that elevation by climbing back up to the saddle between Striped and Goodale. This was not so much fun. We were tired and the slope was more sand/talus, the sun baking our backs as we toiled upslope. I'd hoped the messy stuff was done with for a while when we went over the saddle but my memory from climbing Striped some years earlier had failed me. There was still another 500ft of boulder descent before we caught a break on easier terrain in the high basin draining into Taboose Creek. This was the part that I had remembered, compacted, flat rocks on relatively level terrain heading north in a basin between Striped and Goodale. At the unnamed lake NNE of Striped we paused to get water. Eric caught up with us at this juncture, coming down from the summit of Striped in good time. He had managed the bonus summit in the same time three of us spent just getting around the mountain. He reported running into a biologist at the summit spending the day doing a "sheep count". Her partner was another biologist we had seen on the summit of Pinchot. She had been observing our doings since we had arrived at Striped South, as surprised to see us as we had been surprised to see them. While Jonathan and Nick spent more time refreshing at the lake, Eric and I took off, following the shortcut down the lake's drainage that bypasses a return to Taboose Pass. This took us down a blocky, bouldery slope with a rush of cascading water flowing down the middle, an interesting class 3 route back to the Taboose Trail. We reconnected with the trail about 1,200ft below the top of the pass, more than a mile down the east side. Though Eric would stop from time to time to feast on trailside berries much like a foraging bear, he would still beat me back to the TH by some 20min. I just couldn't jog down the canyon as easily as an 18yr-old, having to walk through the uneven sections as much to give my knees a rest as to keep from stumbling and crashing to the ground. I found Eric resting in the shade behind the TH sign when I returned shortly before 3:30p. Not 30 seconds on my heels were Nick, Jonathan and Michael who, unbeknownst to me, had been trying to catch me from behind and nearly succeeded. We had a good laugh before getting out of our boots and driving down to Independence for the evening. Luke and JD were successful in reaching Ruskin, returning at 4:40p and 5:45p, respectively. Tom would be the last to return to the trailhead just after 6p, having made it to Striped Mtn but then slowing considerably on the return. Eric took the lead for the Yellow Jersey by finishing ahead of me today. He would not relinquish the lead over the rest of the Challenge, in fact adding considerably to it. There was no real competition for the White (under 25yrs) or the King of the Mountain jersies. Eric would be the first to take all three titles during the Challenge. The only race was for the Green jersey for which I still held a 45min lead over Jonathan.